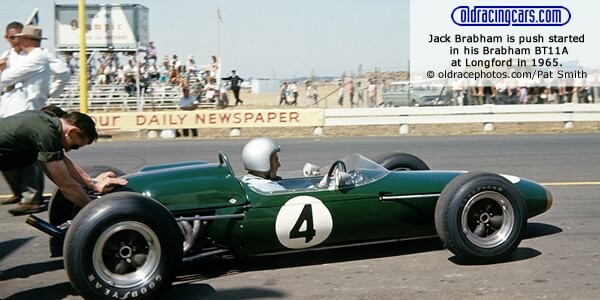 Both champion Bruce Mclaren and his main rival Jack Brabham returned for 1965 but Team Lotus also joined in with a Lotus 32B for Jim Clark and the Scotsman ran away with the title, winning four of the seven races plus the non-championship race at Lakeside. McLaren in his new Cooper T79 and Brabham in a new Brabham BT11A each won one race, as did Graham Hill, guest-driving the Scuderia Veloce BT11A. Of the locals, Australian expat Frank Gardner in Alec Mildren's BT11A and Jim Palmer in his private Brabham BT7A shared fourth in the championship with McLaren's teammate Phil Hill. Frank Matich still had his BT7A and still suffered unreliability, his only finish being third place at Warwick Farm. Brabhams filled seven of the top ten places in the championship table. 14 Feb 1965 > Warwick Farm "100"
07 Mar 1965 > Lakeside "99"